As a Content Marketing Agency, you’re already doing the hard part in generating content for your clients. But what if there was a way, with just a bit more effort, to generate a lot more benefit for your clients and for your agency? 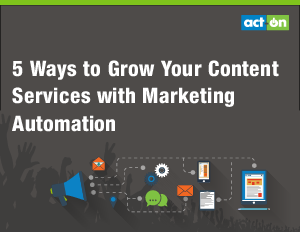 In our eBook, “5 Ways to Grow Your Content Services with Marketing Automation,” you'll learn how marketing automation can expand the value and impact of your content marketing engagements.